This week, I had expected there to be six of us so was planning to split into two groups. However, when we learned Mark W was stuck on Ludlow station, we opted to try Friedemann Friese’s latest game – Power Grid: Factory Manager – a game which has nothing to do with Power Grid but is still a tense, economic optimisation game. The game is played over five rounds and each round is identical: Firstly, you bid for turn order tiles, which also determine how much discount you receive on your purchases each round. Then each player selects which factory components will be available for purchase, with the cheapest of each component having to be selected for possible sale before the more juicy stuff. 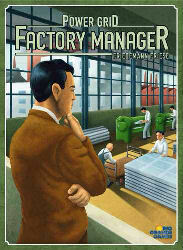 Each player then buys what they want or can afford and places them in their factory. You are trying to obtain components that increase your production and storage or decrease your manpower requirements, while keeping control on your energy costs. Each time you add / replace something in your factory, you adjust these four factors and then receive income based on the lower of your production / storage capacity, after paying your energy costs (the price of which increases during the game. Income in the final round is doubled and then whoever has the most money wins. We all thought this was an excellent design although, with five players, more stuff comes into the market and the length of the game increases accordingly. It took us around 2.5 hours to play, which is a bit long particularly as there is a big chunk of downtime while others take their turns. Nige and I almost decided to play a game of Macao while we were waiting at one stage. In the first round of our game, only one storage tile came up so the first player (me) snapped it up and gained an early income advantage on the others, although I had to tie up more workers for the next round. Mechanisation seemed a good option as it releases more workers to buy stuff with so by the third round some of us had factories completely populated by robots. I think Nige and I were the only ones to take seasonal workers in one round but Nige soon saw the error of his ways as he didn’t actually employ them in the next round so had basically wasted 14 Elektros. The fourth round saw me last in player order but with nothing decent to buy. I needed storage but there was none so I had to have a frugal round, spending just a little on upgrading a couple of machines. However, it meant I needed to be first in player order for the final round and it cost me two workers to secure that. However, I could still afford it in my robot-run factory. Guy on the other hand had all bar one of his workers in the canteen, although he was ahead on the income scale the previous round, so we experienced the quickest Guy turn ever in the history of the club. He had placed his worker for turn order so could add nothing to the market and had nothing to buy. We knew the scores were going to be close but didn’t realise it ws that close as just 6 Elektros separated first and third. My “bad” penultimate turn, where I virtually spent nothing was just enough to give me the win – phew! As I said, very tense. Ratings were pretty good although Nige and I knocked it down a notch due to the game length. Interested to see how it plays with 3 or 4 players. TheÂ Mystery ExpressÂ webpage contains lots of info about the game, including a link to the rules. You can also pre-order a copy for â‚¬45.00, so I guess it’ll be around Â£40 when it hits the shops. It is due to ship around 24th March 2010. 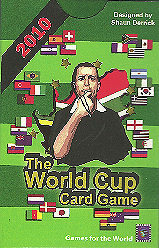 The World Cup Card Game 2010: Cameroon champions? This week, I’d just got a copy of The World Cup Card Game 2010 which, unsurprisingly, is a card game version of the board game The World Cup Game, centred on the 2010 tournament. Designed by Shaun Derrick and published by Games for the World, it is simply a deck of cards and a two page rule sheet. The game is split into two phases: The group stage involves the 32 teams in 8 groups playing in a round robin league format. Each team receives 7 or 8 cards and the team manager will choose between 1 and 4 of the cards to allocate to each of their three matches. The cards vary between goal cards (1-3 goals depending on the strength of the team); attack cards, a pair of which counts as a goal and a singleton giving a chance at a goal based on the draw of a further card; penalty cards which are similar to singleton attacks but with a greater chance of scoring; defence cards which cancel attack cards; and foul/offside cards which cancel goals or attacks. Games are quickly resolved but choosing how many cards to allocate can be tricky as you need to determine which games you need to winn or can afford to lose. Still, if you’ve drawn rubbish cards to start with, you aren’t going to create many scoring chances however hard you try to perm them. TWCCG is a fun game to play and has some interesting tactics but is to a great extent dependent on the cards you draw. I found the group stages more interesting than the knockout as allocating cards between three games involved more planning and guessing what the other team managers would be doing; the knockout was in the main just an exercise of placing good cards on your team and bad cards on your direct opponent so reallyÂ came down to who had drawn the better cards. Still, the game is easy to play, gives lots of opportunity to cheer your own good fortune or laugh at others’ misfortune, and is one that is easily played anywhere as it is simply a deck of cards. You do, however, need to download the score sheet to keep track of the tournament. We all enjoyed our first game although it took us just a bit longer than the 75 minutes advertised on the box. However, this is another good addition to the collection and will definitely see more play as we get closer to the real tournament. In our game, we slightly varied the initial allocation of teams: The rules say teams are dealt out at random but I decided to split the top eight seeds so that all six of us got at least one decent team. Thankfully, everyone got a team through the group stages, although I was down to my last team, Argentina, having only drawnÂ five teams (rather thanÂ some others receiving six) and my others being the mighty North Korea, South Korea, ChileÂ and Japan. In the round of 16, we saw two penalty shoot-outs with Ivory Coast defeating Switzerland 4-3 and my own Argentina scraping through 7-6 against Mark G’s France. However, my luck came to an end in the Quarters and both Mark K and I were relegated to spectators for the rest of the game. England (Guy) lost in the semi-finals and inevitably lost to Uruguay (Mark G) on penalties in the third place play-off. The final ended up being a goal-fest with Cameroon (Nige) eventually overcoming The Netherlands (Steve) 6-4, although Nige’s top decking skills in the final had to be seen to be believed. Great fun. Author Garry LloydPosted on 7th February 2010 9th February 2010 Categories SnippetsLeave a comment on The World Cup Card Game 2010: Cameroon champions? 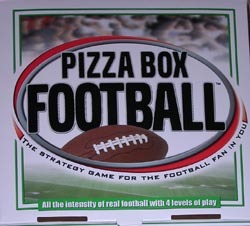 With the Superbowl coming up this Sunday, it was time to dig out Pizza Box Football for my annual predict the score using the team sheets produced specifically for this game by On The Line Games. So, here’s a quick summary of what you can expect to happen in Superbowl XLIV. The first quarter started slowly with both teams unable to make significant ground and trading punts. The Saints were first on the scoreboard with a 44 yard field goal but the Colts replied on the following drive with a field goal of their own. As time ticked down on the first quarter, New Orleans took the ball down to the opposition’s 16 yard line but the next play saw a completed 14 yard pass fumbled. Luckily for the Saints, they recovered it and ran the ball in next play. On the Saints’ next possession, they again drove down the field but quarterback, Drew Brees, saw a pass intercepted in the end zone and, after a couple of traded punts, Peyton Manning completed a 50 yard touchdown pass to tie the scores. With just over 2 minutes left in the half, New Orleans capped a 13 play drive with a second converted touchdown to end the half ahead 17-10. In the third quarter, the Saints were more than ready to use their rushing game to run down the clock and successfully converted two more touchdowns, with Indianapolis struggling to get their offense to click. However, Manning wasn’t ready to throw in the towel yet and the Colts took it into the End Zone on the final play of the quarter (31-17). New Orleans continued to concentrate on the running game in the fourth quarter but neither team were able to make much progress. However, with just over five minutes left on the clock, a blocked punt from Indianapolis gave the Saints the ball on their opponents’ 5 yard line. Three rushing attempts later saw a fifth touchdown for the Saints and one hand on the trophy. Manning and the Colts knew they had to take risks and their next drive left them with a fourth and goal attempt, which resulted in a completed pass held up by the Saints defence one yard shy of a touchdown. So it was all over, the Saints ran down the clock and registered their first ever Superbowl win with a score of 38-17. This monthâ€™s target is the same as last month’s i.e. to get at least belowÂ 75 this time next month. 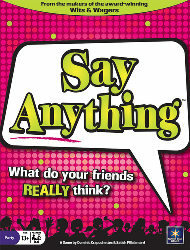 Shaun Derrick has just announced that a card game based on his popular World Cup Game system is now available to buy. The WCCG has 64 cards divided into 32 Team cards and 32 Action cards. Each group match is played individually but this takes seconds to resolve, then the KO stages are played in a similar way to the Board Game. The game costs Â£5.95 plus p&p and can be ordered from the Games For The World website. Further details including a detailed example of play can be found here.